This salad is really seasonal and fresh! I received some beautiful pears in a meal delivery box this week and incorporated them into this fun lunch. 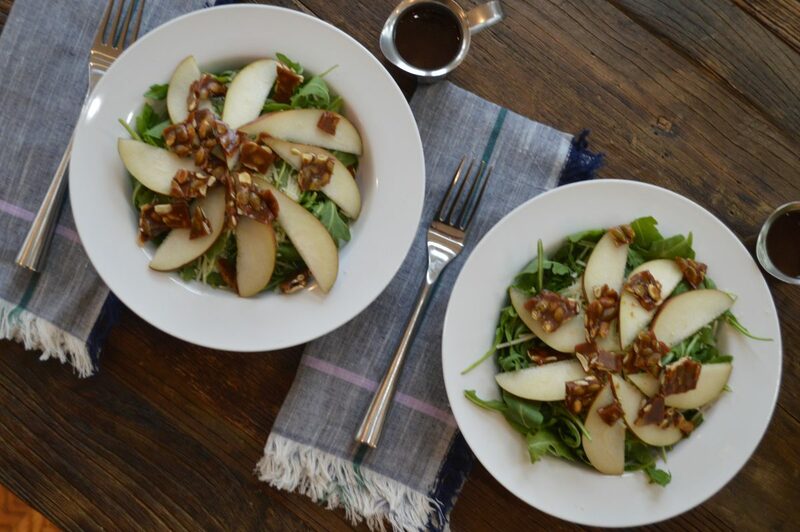 I used arugula, Parmesan and a spicy Balsamic Vinaigrette to balance out the sweetness of the pears and the brittle. This would also be a lovely salad to accompany your Thanksgiving dinner! Core the pears and cut them into thin slices. Divide the arugula between four bowls. Top the arugula with Parmesan. Arrange the pear slices on the salad. Top the salad with Pepita Brittle. Serve with a side of dressing. Line a baking sheet with a piece of parchment paper and set it aside. Add the sugar and honey and bring the mixture to a boil, stirring consistently. Use a candy thermometer to measure the temperature. When the mixture reaches 280 degrees, add the pepitas. When the mixture reaches 300 degrees remove the pan from heat. Pour the mixture onto the lined baking sheet. After the brittle is completely cool, break it into bite sized pieces.